Continuous 1000W @ 40 Degree Celsius. Glacier 1000M. Modular Design. Strong Single 12V Rail - Ideal for Gaming Systems. Modular Cable Single strong 12V rail – ideal for gaming system. 6 x 6 2-Pin. EVGA SuperNOVA 1300G2 1300 Watt 80 Plus Gold Modular Power Supply. Condition is Used. Cables and power cord included. Shipped with USPS Priority Mail. Please feel free to contact me anytime with questions. In perfect working condition, still under warranty. 650W Single 12V Rail. Model: SuperNOVA 650 P2. Manufacturer: EVGA. 80 Plus Platinum. 431 N Wright Brothers Drive. Provide our staff with Item Condition: Open box. Pickup Location. Modular: No. Output Power: 650 W. General Information. Technical Information. Weight (Approximate): 3 lb. Depth: 5.5". Width: 5.9". Height: 3.3". All original contents, including all modular cables, and manual are included. Fully Modular to reduce clutter and improve airflow. 80 PLUS Gold certified, with 90% (115VAC) / 92% (220VAC~240VAC) efficiency or higher under typical loads. With all Japanese 105°C capacitors, they’re a great choice for high performance PCs where reliability is essential. And, the fully modular, low profile cable set makes builds and upgrades easy, with clean, great-looking results. I will work with you to make things right. Maintain the optimal temperature of your machine with this Thermaltake fan. This Thermaltake fan has a face-up design, so you can see the RGB lights. Active Power Factor Correction (PFC). Modular: Fully modular. Model: RM1000x. Fully modular. 80 Plus Gold certified. We are not an authorized dealer of this product and any warranty included with the product may not be honored by the manufacturer. Condition: New--opened box, unused. Corsair CX850M Fully Modular 850 Watt 80 Bronze Rated Power Supply. Condition is Used. Shipped with USPS Priority Mail. Manufacturer: Seasonic. Modular Cable Design. Modular Chain Link Connector Design. The cable set is unused. 1 x CG05: 8 Pin To 8 Pin Power. ATX And PCIE Power Cable Set. Lab & Test. SATA/IDE Power Cable Set. Corsair CXM series CX550M 550W ATX 80 PLUS Bronze Modular Power Supply PSU New. Condition is New. Shipped with USPS Priority Mail. Modular: Yes. 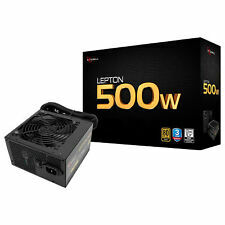 Output Power: 750 W. Efficiency: 90%. Technical Information. Limited Warranty: 10 Year. Weight (Approximate): 7 lb. Depth: 6.7". Width: 5.9". Brand New, Unopened, Rosewill Hive 750W Modular Gaming Power Supply, 80 PLUS Bronze Certified. Purchased last year for a couple systems I never ended up building. Shipped with USPS Priority Mail. 1 x 20 4 Pin Power. 1 White LED 135mm fan (Can be turned on and off with switch on the connector side) my Hyper 212 Evo is louder than it so its pretty quiet. 1 x 8 Pin CPU. thermaltake power supply Toughpower Xt 775W. Condition is Used. Exterior is in great condition! no box included. It is an open box, new item. 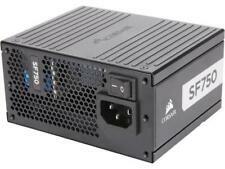 PowerSpec 650 Watt 80 Plus Bronze ATX Semi-Modular Power Supply. Condition is Used. Shipped with USPS Priority Mail. PowerSpec power supplies provide the ideal balance of price and performance. The PS 650BSM provides 650W of continuous power. Rated 80 Bronze for greater than 82% efficiency. Semi-Modular cables for flexibility that are fully sleeved. Includes a 135mm fan for quiet operation. Trending at $34.33eBay determines this price through a machine learned model of the product's sale prices within the last 90 days. Since its launch in 2013, the EVGA SuperNOVA G1 power supplies have been among the longest-lasting and best-performing power supplies on the market. EVGA SuperNOVA G1 provides up to 54A on a single rail! We will respond promptly to your inquiry. it was pulled from a working unit. Item appear as pictured.